Today we’d like to introduce you to Deb Williams. Deb, can you briefly walk us through your story – how you started and how you got to where you are today. Recycled automotive paint. 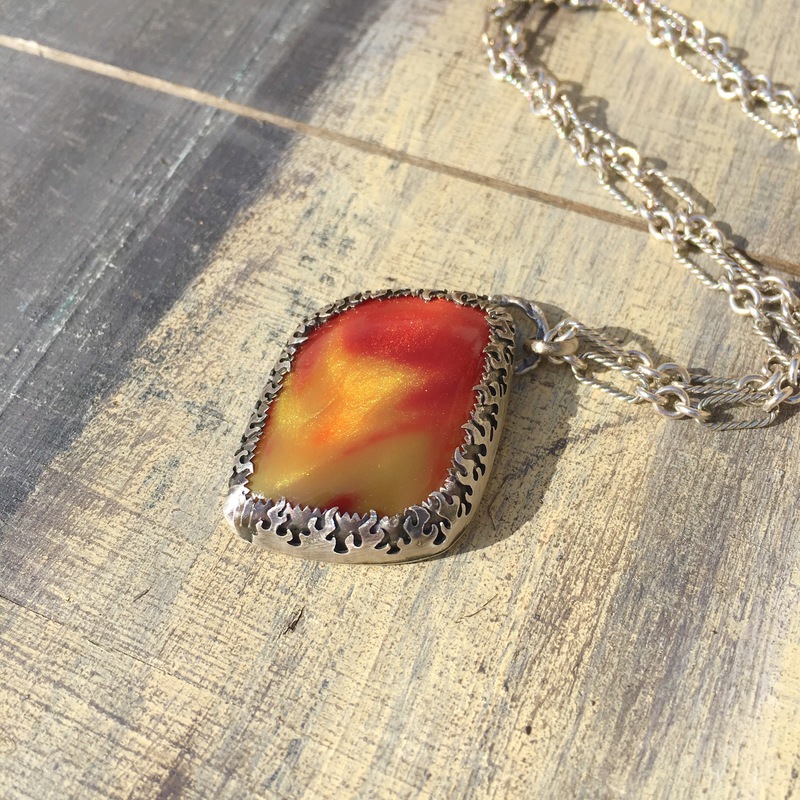 A few short years ago, if you asked me what I thought about starting a business that is focused primarily on jewelry made from recycled waste, I’m certain I would have laughed at you, given my family history and career in the fine jewelry industry. My maternal grandfather was a classic rockhound, lapidary artist and made jewelry as a hobby. When my parents married, he taught my father how to cut opals, his passion and my birthstone. My parents divorced when I was young and my father went on to open three jewelry stores in Grossmont Center in La Mesa: Exclusive Opals and Diamonds, Exclusive Pearls and Lloyd’s Jewelers. After high school and a couple of years studying art at Palomar Community College, I decided I wanted to work in the family store, made the transition and left my hometown of Vista and moved south. Unfortunately, my father suddenly passed away when I was twenty-three years old and all three stores were lost within a matter of years. I was faced with a decision as to whether continue on with the jewelry business or return home to Vista and Palomar. I chose to stay and took a job working with Nordstrom, in their high-end jewelry department. Nordstrom ended up taking me, and my husband, up to Bellevue Washington where I continued with my fine jewelry career there for eight years, before I left to explore other job opportunities. I’d become a mother by this point, so I needed more family-friendly hours within the industry. I worked several places like Tiffany & Co. and E.E. Robbins, a store focusing on designer engagement rings. It was during this time that I became a single mother and started my jewelry business so that I could earn a little extra money to help make ends meet. I had the intention of working my business and learning new things while raising my daughter, until it was time to execute and make it my full time job, my plan B. My business was simple to start with. I made macrame necklaces and put them on eBay at $15 each. All three sold! So I made more. They sold too! That is when I started Hemp Hemp Hooray. I thought the name was cute and very appropriate until I decided I needed to move beyond macrame and hemp with a name that didn’t make me sound like a stoner hippie. BeachVibe Jewelry was born. Through the years, I worked with different things from polymer clay items, gold plating diecast cars, wire wrapping, beadwork and eventually metal work. After being away from home for 14 years, I decided that it was time to return to my family in California. In August of 2007, my daughter and I made it back to Vista. I was finally home. In November, I took a position as a diamond grader with The Gemological Institute of America in Carlsbad. My career flourished there for over ten years, and I became a trainer, as well as an expat where I traveled to South Africa. I spent five months there, not only training but establishing life long friendships that have become like family to me. 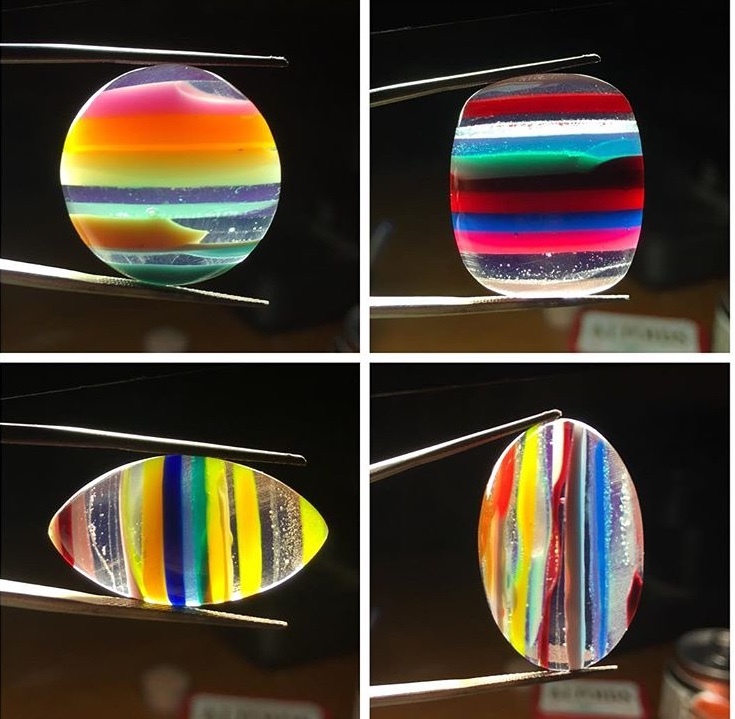 During my time at GIA, I started taking lapidary classes from The Vista Gem and Mineral Society as a hobby and in hopes of taking BeachVibe in a different direction than beading and wire work. 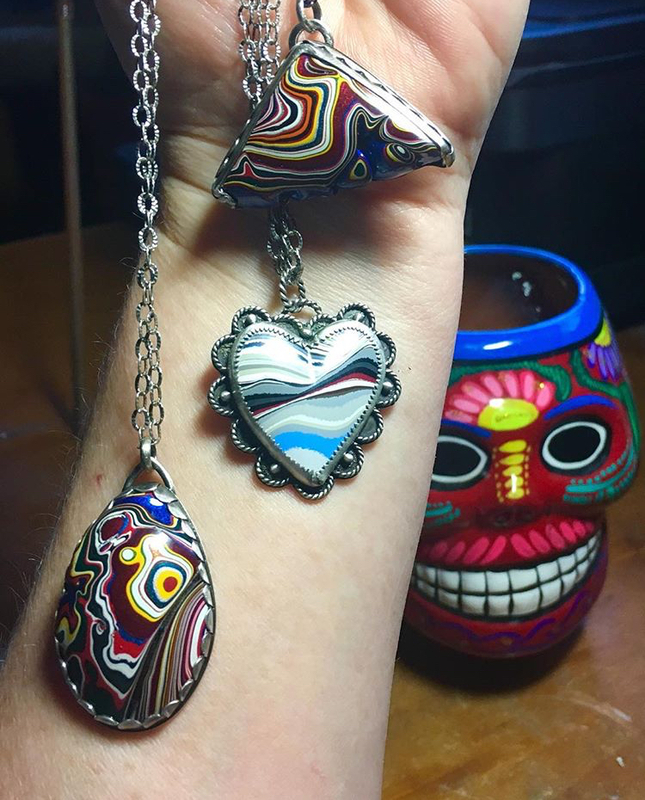 One day, a coworker gave me a sample of some fordite to play with and cut. 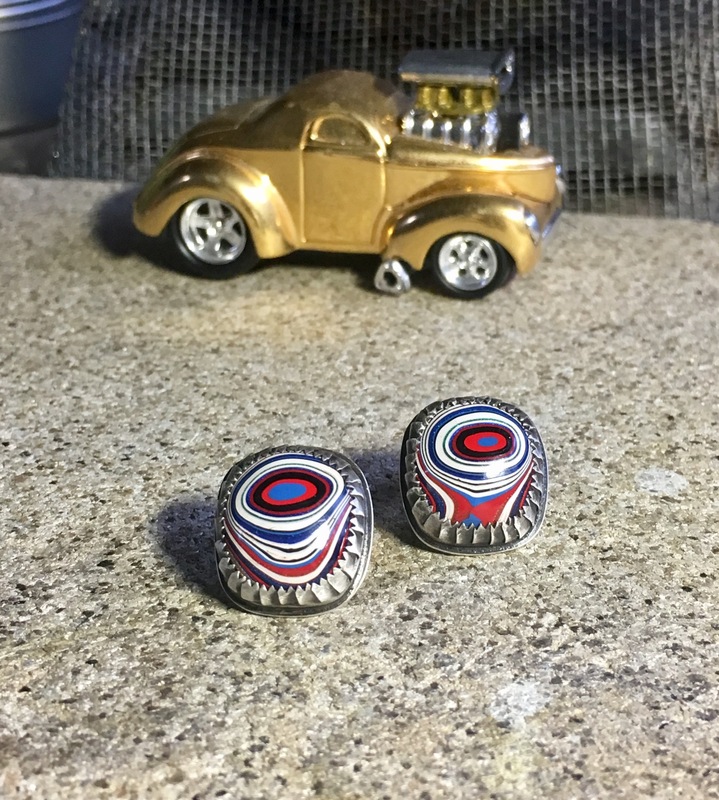 Fordite? Recycled paint? Surely you jest… I come from a high-end jewelry background! I hate to admit that I even rolled my eyes at him, but said I’d give it a try. Needless to say, one swipe on that polishing wheel and I was hooked! I had been bitten by the upcycled bug! 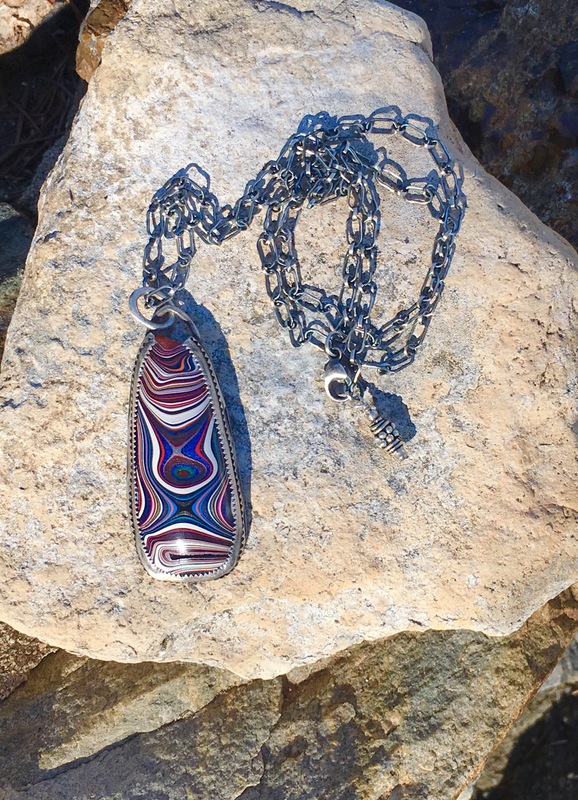 I. played with fordite for almost a year when my body finally gave out. One morning in March of 2018, my fiancée brought me coffee in bed. As I reached for it, my neck kinked, shoulder seized, and I couldn’t move. My body finally said NO MORE to sitting in front of a microscope, after a decade of doing it. I went out of work and into rehabilitation for three months. It was during this time that I decided that the time had come to execute my plan B in life, I was faced with a choice. Rehabilitate, only to return to the job that would likely re-injure me in the future, or just go for it and not look back. I’d been messing around with silversmithing and liked it, knowing that was the direction I wanted to go in my pursuit of plan B. So I went for it! During my rehabilitation, I was disciplined, serious and treated my time like I was at a job, training myself on how to make jewelry. The sawing actually helped with the rehab, so my doctor was all on board with what I was doing. June 1, 2018, I quit my steady, secure, killer benefits job I was good at. 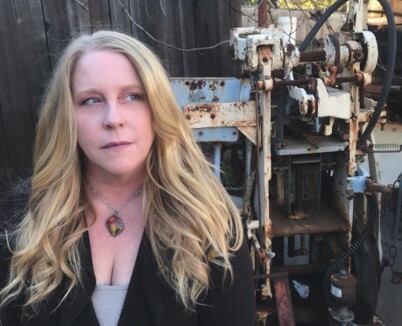 I had major debt from raising a child in Southern California alone, so I cashed out my 401k, knowing I would lose half of it, and paid off all of my debt, bought equipment and materials. I didn’t look back and just went for it. This last year has been filled with long days, hard work, lots of learning and sacrifice. 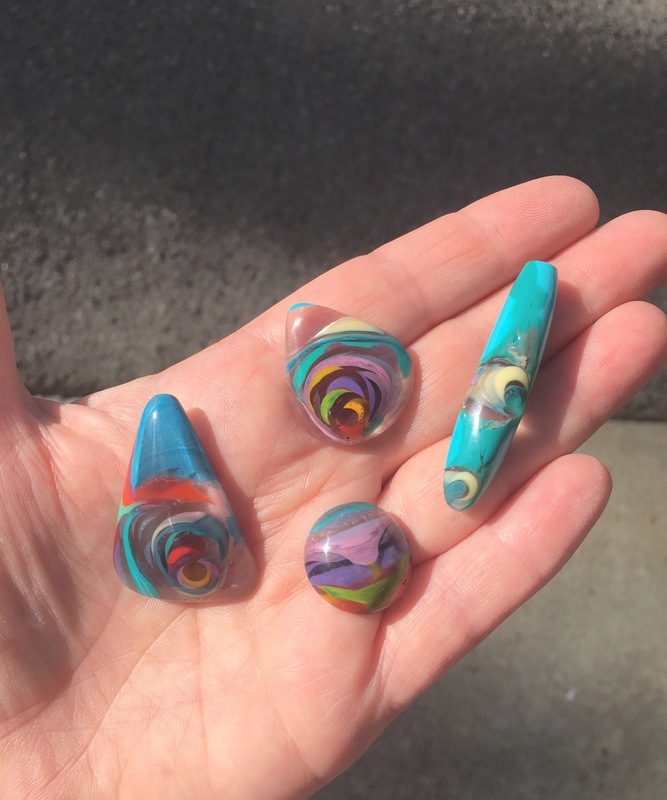 I’ve expanded my love of upcycled materials into using surfite, recycled surfboard resin that is harvested locally in Oceanside, and bowlerite (yes, bowling balls). It has been a whirlwind of color and flying paint, resin, and acrylic, but it has also been one of accomplishment and goals being reached. 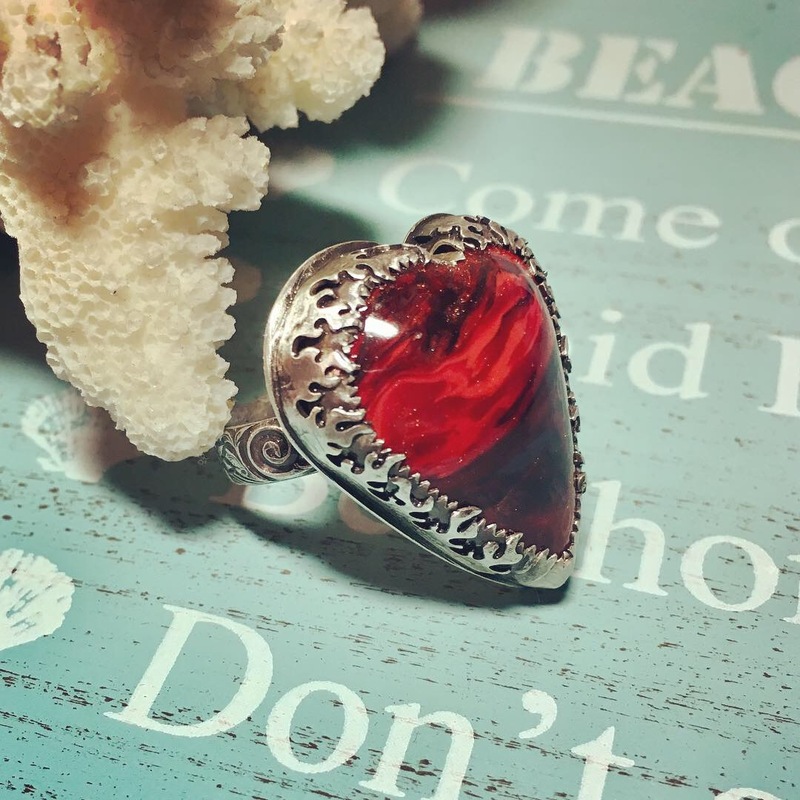 I have a successful Etsy store and have a retail space for my jewelry at SeaHive Marketplace in Oceanside, with plans to open more retail spaces for my brand in the future. One of the hardest things in life is to put your head down and jump. It’s scary out there, but you only get one shot in this life, so go find your passion and run with it! I did, and now I cannot imagine doing anything else. It has been challenging, as I was a single mother struggling to raise a daughter alone in Southern California. However, those challenges and struggles helped define me and enabled me to grow into the strong and determined woman I am today. 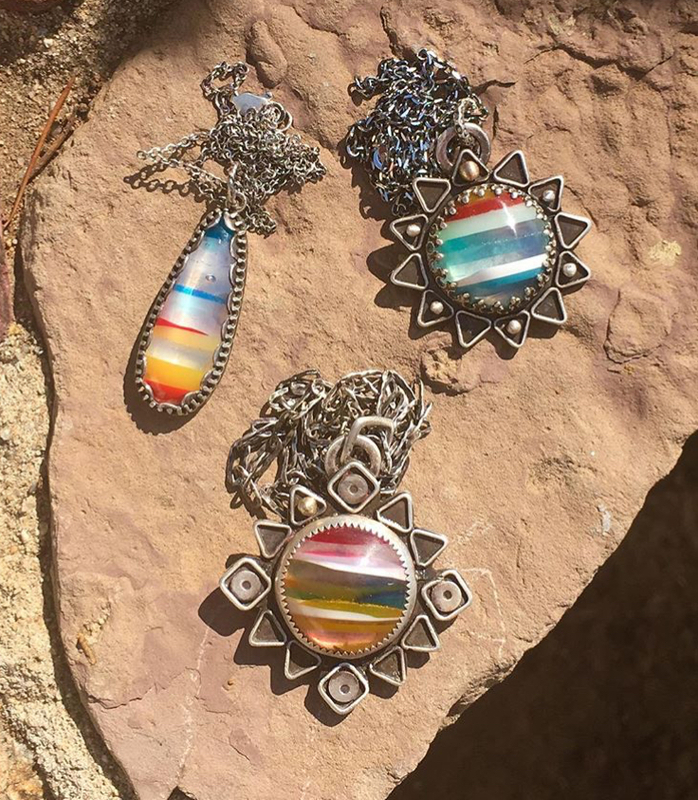 I create unique, one of a kind jewelry using recycled automotive paint (fordite), recycled surfboard resin locally sourced in Oceanside (surfite), and recycled bowling balls (bowlerite). I do all of the lapidary work, design, and silversmithing. My colleague and I harvest and process the surfite ourselves. I’ve designed my business model around upcycled products, and I’m proud of the fact that I saw an opportunity and pursued it. As a result, I’m living my dream. Im not the first to have worked with these products, but I love them and want to make a difference in this world. Creating beautiful jewelry out of something that would end up in a landfill is part of my contribution to this planet. San Diego is the perfect place for my business because we care about the environment here. Any any way to improve is good, even if it is the smallest thing, like a piece of jewelry. Featuring recycled surfboard resin, in a beach town, seemed like a good idea and so far it’s working.